Western blot analysis of extracts from COS cells, untreated or treated with either U0126 #9903 (10 µM for 1h) or TPA #9905 (200 nM for 10 m), using Phospho-p44/42 MAPK (Erk1/2) (Thr202/Tyr204) (D13.14.4E) Rabbit mAb #4370 and p44/42 MAPK (Erk1/2) (3A7) Mouse mAb #9107. 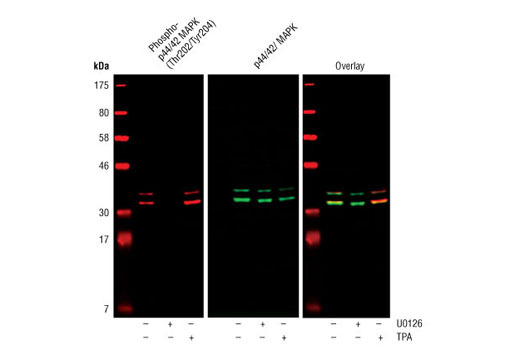 Western blot analysis of extracts from various cells, using p44/42 MAPK (Erk1/2) (3A7) Mouse mAb. 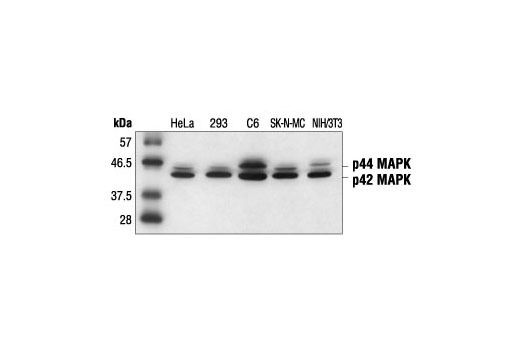 p44/42 MAPK (Erk1/2) (3A7) Mouse mAb detects endogenous levels of total p44/42 MAP kinase (Erk1/2). It does not cross-react with either JNK/SAPK or p38 MAP kinase. Monoclonal antibody is produced by immunizing animals with a synthetic peptide corresponding to the sequence of p44/42 MAP kinase.